Eleutherodactylus coqui is a relatively small tree frog native to Puerto Rico. The frogs are quite adaptable to different ecological zones and elevations. Their loud call is the main reason they are considered a pest. E. coqui's mating call is its namesake, a high-pitched, two-note \"co-qui\" (ko-kee') which attains nearly 100 decibels at 0.5 metres. E. coqui have a voracious appetite and there is concern in Hawai‘i, where it has been introduced, that E. coqui may put Hawai‘i’s endemic insect and spider species at risk and compete with endemic birds and other native fauna which rely on insects for food. 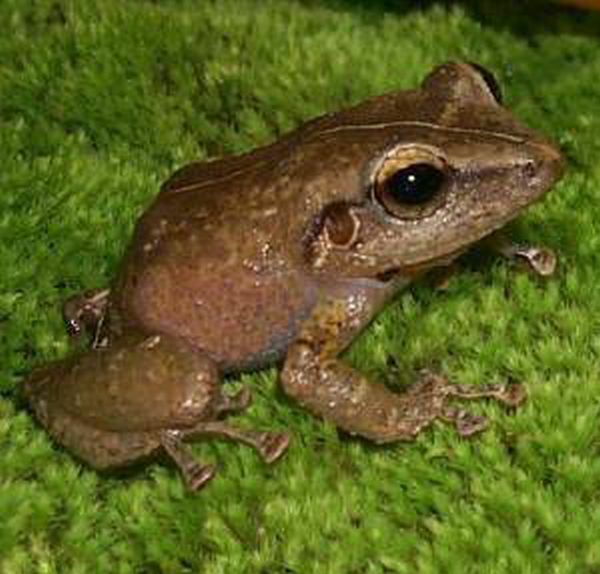 Eleutherodactylus coqui is described as a relatively small treefrog. In Puerto Rico, mature calling males and \"parental males\" (males guarding a clutch) average about 34mm in length from snout to vent (snout-vent length, or SVL), while mature egg-laying females average about 41mm SVL. Like the true treefrogs (family Hylidae), E. coqui have well developed pads at the end of each toe that are used for sticking to surfaces. E. coqui are extremely variable in colouration. The dorsum (upper surface) is generally grey or grey-brown and uniform in colour, or may have either a dark \"M\" shape between the shoulders, two broad, light dorso-lateral bars (from the snout, through to the eye, to the axila of the rear legs) bordered with black spots and/or a light bar on top of the head between the eyes and a light underside stippled with brown (Campbell, 2000). Eleutherodactylus coqui utilise internal fertilisation and, like other eleutherodactylids, the fertilised egg undergoes direct development, rather than passing through a free-living larval (tadpole) stage, so standing water is not required for egg laying. The time period between clutches is around eight weeks (Campbell, 2000). Eleutherodactylus coqui themselves form parts of the diets of birds and nocturnal mammals. They are known to form the diet of the giant crab spiders, Olios spp. and the Puerto Rican racer (a snake), Alsophis portoricensis. Eleutherodactylus coqui have been described as a habitat generalist. Quantitaive studies on habitat preferences of E. coqui in its native range showed that habitat use was at different heights from the forest floor. Adults were seen to have a wider preference for a range of heights compared to juveniles. Adults have demonstrated a strong positive association with dead, fallen leaves and early successional species, such as Cecropia, Heliconia and Prestoea. E. coqui generally have positive associations with shrubs and negative associations with grasses, vines and ferns. Exceptions include Philodendron angustatum and Danea nodosa, which both have a broad leaf structure and are thus able to provide better structural support than other species in those habitat categories. (Beard et al. 2003). Kraus and Campbell (2002) report evidence that the ecological range of E. coqui in Hawai‘i has continued to expand. Initially the frogs were reported from relatively low elevations (0–670m). Subsequent studies show that a large population has survived and overwintered at 920m elevation. Four other populations have survived two winters at elevations of 1170m. In their native Puerto Rico, E. coqui occcur at the upper elevation of 1200m. Eleutherodactylus coqui reproduce year-round in their native range, but breeding activity is concentrated in the wet season. Female E. coqui lay 4-6 clutches of about 28 eggs each (range 16-41) per year. The time period between clutches is around eight weeks. E. coqui utilise internal fertilisation and, like other eleutherodactylids, the fertilised eggs undergo direct development, rather than passing through a free-living larval (tadpole) stage, so standing water is not required for egg laying. E. coqui are known to utilise the nesting cavities of several bird species in Puerto Rico, including the bananaquit (Coereba flaveola portoricensis), the Puerto Rican bullfinch (Loxigilla portoricensis) and the Puerto Rican tody (Todus mexicanus). Male frogs nest in protected cavities near the ground, such as dead, curled leaves or rolled palm frond petioles. Males, which guard the eggs (to keep them from drying out), are known to leave the nest in severely dry conditions to gather moisture to rehydrate the eggs (Campbell, 2000). Eleutherodactylus coqui is a generalist nocturnal predator and consumes an estimated 114 000 invertebrates per hectare per night (Stewart & Woolbright, 1996). Recommended citation: Global Invasive Species Database (2019) Species profile: Eleutherodactylus coqui. Downloaded from http://www.iucngisd.org/gisd/species.php?sc=105 on 19-04-2019. Experiments were conducted at two spatial scales to investigate the effects of terrestrial frogs (Eleutherodactylus coqui) on aerial and litter invertebrates, plant growth and herbivory, and litter decomposition. Results showed that at both scales, frogs reduced aerial invertebrates and leaf herbivory, but had no effect on litter invertebrates. At the smaller scale, frogs increased foliage production rates, measured as the number of new leaves and new leaf area produced, by 80% and decomposition rates by 20%. These results demonstrate that E. coqui may affect ecosystem functions by decreasing prey items and increasing nutrient cycling rates (Beard et al. 2003). In Hawai‘i where the population is seen to be expanding, there are concerns of ecological as well as anthropogenic affects. The main pathway for spread has been through the nursery trade and there are concerns that there may be a negative effect on the export nursery trade, should shipments be banned for harbouring frogs. E. coqui have spread from horticultural sites where they were first restricted to public land, residential areas and resorts. There are concerns that property value may be affected due to the high biomass of frogs on infested sites (Kraus and Campbell, 2002). The high pitched call of the frog is a disturbance and there are fears this may affect the tourism industry (HEAR, 2004). Preventative measures: Intentional transport of frogs has been banned in Hawai‘i (Kraus and Campbell, 2002). Physical: Hand-capture is a successful method when dealing with small numbers (Kraus and Campbell, 2002). Chemical: Field trials are being conducted to evaluate the efficacy of a direct spray application of a concentrated caffeine and water solution for control on 0.1 - 0.5ha infested plots. If these trials are successful, it is hoped that management agencies in the State of Hawai‘I will be able to reduce the spread and potential impact of these pest species on a landscape scale (Campbell et al. 2002). Spraying of citric acid on infested plants to kill E. coqui eggs, juveniles and adults is recommended (CTAHR, Undated) but evidence of efficacy has not been demonstrated. Informations on Eleutherodactylus coqui has been recorded for the following locations. Click on the name for additional informations. Summary: Population status and management studies in Hawaii. In Turning the tide: the eradication of invasive species. Campbell, T. S. 2000. The Puerto Rican Coqui (Eleutherodactylus coqui Thomas 1966). The Institute for Biological Invasions. College of Tropical Agriculture and human Resources (CTAHR). UNDATED. Control of Coqui Frogs in Hawai i. University of Hawai i at Manoa. Gulf States Marine Fisheries Commission (GSMFC), 2003. Eleutherodactylus coqui (Thomas). University of Southern Mississippi/College of Marine Sciences/Gulf Coast Research Laboratory. Hawaiian Ecosystems at Risk Project (HEAR), 2004. Alien Caribbean Frogs in Hawaii, Problematic frogs trouble people, environment. Kaiser, B., and K. Burnett. 2006. Economic Impacts of E. coqui frogs in Hawaii. Interdisciplinary Environmental Review 8:1-11. Kraus, F., E. W. Campbell, A. Allison, AND T. Pratt. 1999. Eleutherodactylus frog introductions to Hawaii. Herpetological Review 30:21�25. Louis A. Somma. 2008. Eleutherodactylus coqui. USGS Nonindigenous Aquatic Species Database, Gainesville, FL. Summary: A study of the impact species has on native fauna and flora along with some discussion of possible reasons for its invasiveness elsewhere. Summary: A study on the habitat selection of species in its native range. Summary: A genetic study that contains background information on species. McCoid, M.J. 1993. The �new� herpetofauna of Guam, Mariana Islands. Herpetological Review 24:16-17. Stewart, M. M., and L. L. Woolbright. 1996. Amphibians.In D. P. Reagan and R. B. Waide (eds. ), The Food Web of a Tropical Rain Forest, pp. 363� 398. Univ. of Chicago Press, Chicago. Woolbright, 1996. Disturbance influences long-term population patterns in the Puerto Rican frog, Eleutherodactylus coqui (Anura: Leptodactylidae). Biotropica 28:493�501.